The Albion fellowship previously incorporated four branches - Albion, Charlestown, Hurst Nook and Hazelhurst. The Hazelhurst Mission was formed as the result of a committee meeting held Nov. 5th 1903, Resolved that the name be ‘The Hazelhurst Mission’. Earlier in the year 1903, a few friends met together in the house of Mrs. Hannah Platt, afterwards removing to a room, at one time used as a coal store, which they proceeded to make suitable for public worship. The work proved very successful, and the need was felt for more suitable accommodation. Hazelhurst friends began to accumulate funds, and the erection of a suitable Mission Church was begun. The foundation stones of the present structure were laid on Saturday, September 13th 1913. The building itself being opened on December 2 0th of the same year. The Hazlehurst mission was officially closed on November 17th 1996. 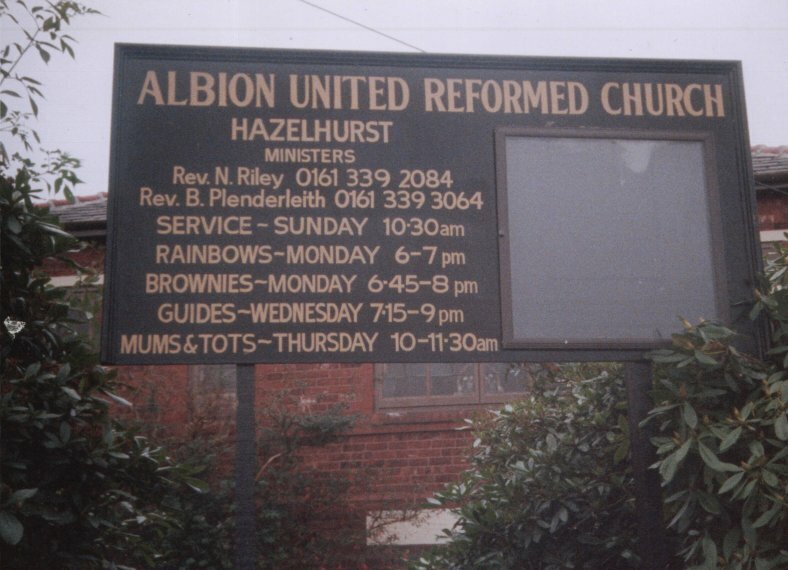 There is a lasting memory of Hazelhurst in Albion, as the right transept has been transformed into "Hazelhurst Corner", with several items that used to be part of Hazelhurst being used to decorate the meeting area.